Do you want to eat a very basic and frugal dish coming from Italian tradition, but at the same time very, very tasty? Pleased to introduce you to Pancotto! Water and old bread are the core elements of this great recipe: you could use chicken or meat broth instead of water, and add one or two cloves of crushed garlic inside, or adjusting the soup with grated Pecorino Romano. 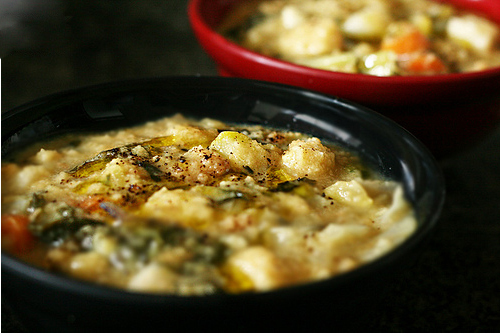 You could stir a beaten egg into the broth but the idea is always the same all over Italy! We are going to show you two simple variations of this great peasant dish coming from the South of Italy, one from Basilicata and one from Campania. Here we go with Pane Cotto lucano: set the water to heat, crumble the old bread slices into 4 bowls, beat the eggs, and chop the basil. Heat the oil in a pot with the water. Saute the garlic and hot pepper for a minute or two. Add the water, bring the mixture to a boil. Stir in two eggs and the basil; put the mixture over the bread. Of course, you could use broth or stock to make it tastier or you could add some freshl Pecorino Romano to top it all! The Campanian recipe was as well a way to eat leftover bread that was much too precious to be thrown away. Bring the water to a boil, salt it, and put a bit of pepper, add some bay leaves (4-8). Let it boil for a few minutes, in the while crumble the pieces of bread and put them into the soup bowls. Spoon the quickly made broth over the bread, let it absorb it for a few minutes, and serve. Easy, and tasty! This entry was posted on Monday, April 23rd, 2012 at 5:37 pm	and is filed under Italian Recipes and Food. You can follow any responses to this entry through the RSS 2.0 feed. You can leave a response, or trackback from your own site. « April and Italy: nice match!